There is a reason that most apartments come in layout options of studio, 1 bedroom, or 2 bedrooms. Those small spaces are designed for and marketed to young single people. While renting an apartment could be the right decision for a number of people, this blog post gives you a few great reasons to buy a home instead. Rent prices rise every year. When your lease expires and you are confronted with the decision to pay higher rent prices or move to a different apartment… it may be time to consider buying a home. If you have a good credit history, stable career and, don’t plan to move for a few years, you should consider investing in a home of your own. Rent prices for a 1 or 2 bedroom apartment are often higher than the price of a monthly mortgage payment on a 3 bedroom house more than twice the size. The financial difference here is that a renter is paying for the landlords investment instead of their own. If your current budget allows you to pay your rent on time each month, then you likely won’t have an issue keeping up with a mortgage. That means the main financial focus you might have is saving up for the down payment and closing costs. While a traditional mortgage requires a 20% down payment on the purchase price of the home, there are great loan programs available. Other options offer as little as 5% or even 3.5% down payment at closing. Loan programs also allow documented “gift” funds from a family member or organization to help cover the down payment. Talking to a licensed loan officer about your mortgage options can help you understand your potential to invest in a home. When you are renting, having a roommate to split the bills can be an advantage and a headache. It can also be a potential risk to your credit. If your roommate can’t pay their half of the rent or pays late, that could be included on your credit report as well. On the other hand, if you own a home as a single person, considering a roommate could be an advantage. As the landlord you could set the rules and their rent could help you with mortgage payments. After qualifying for a mortgage loan and set your budget, having a friend or family member rent a room could be a bonus perk of buying your own home. Property values in Texas are on the rise, especially in the fast growing areas. If you own a home, that means that your equity is growing while your mortgage payment will stay the same. Home equity is an asset that you are building now as a home owner, which can be used later in life. This is one of the best financial reasons to buy a home, rather than renting. 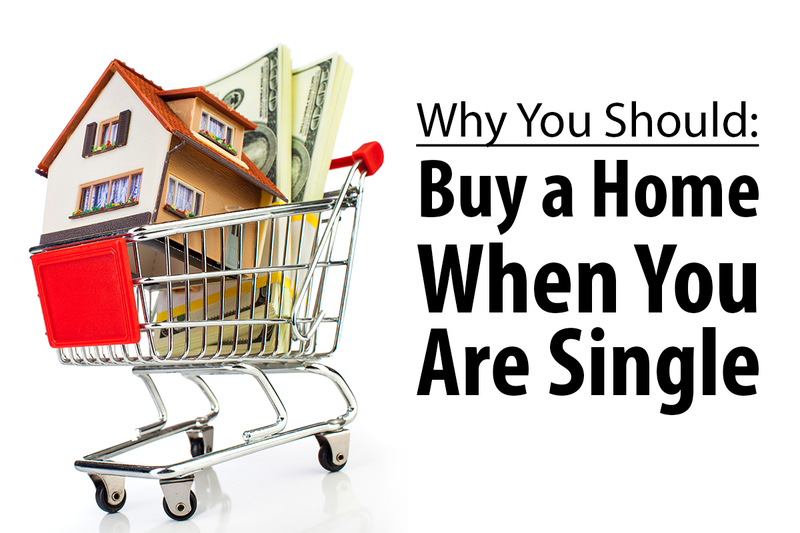 When you are single you may be happy in a smaller, less expensive home. However, when you start to build a family or feel that it is time for a larger space, the smaller home can give you a big advantage in making the upgrade. You could sell the home and use the equity to invest in the new home. There is also the potential of using your first home as a rental property and using that income to help you pay for a larger home. Another option is getting a cash-out refinance loan to use you home equity to renovate your current home and make it what your bigger family may need. While some people may not consider buying a home until they are married, buying a home as a single person could be a great financial decision. If you are ready to buy a home, we are here to help! Reach out to us today to start the conversation!